The birds come back first, though it’s seven degrees out. I watch them: raucous, small-bodied rebels, singing in the trees. Red-breasted balls of blue fluff, they wear their colors as a dare — an act of defiance against February’s gray. I watch them: hopping. Chattering. 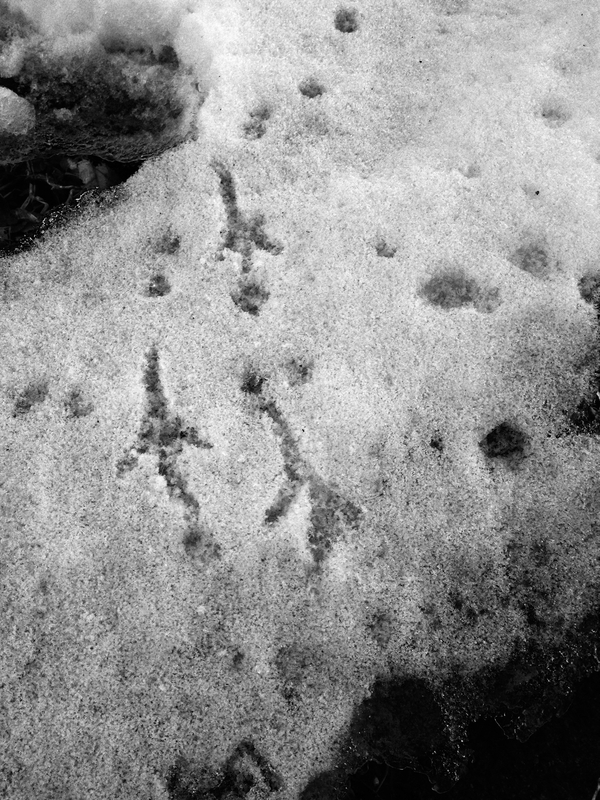 They warble and catcall, leaving a complicated series of footprints on the snow, like the steps of some wild and tribal sort of dance. As if winter was a thing to be laughed at. Though I’m unsure of it, I slip on a pair of electric-blue stilettos. Twirl in front of the mirror, just to try it. Tip back my head and laugh. And it still feels like an act, so I wear all-black instead, and go out into the gray in more orderly fashion. Still: I am listening to the birds, and I am learning. Tonight I set out those blue shoes, thinking, perhaps. Maybe tomorrow, or the next day, when there are a few more signs of spring. You pulled me right into your world of gray and blue and birdsong. Just lovely. Fantastic. You have inspired me to go for the blue stilettos. Tempting spring, I love it! This is great! May each of us try one brave new thing every day! Sassy, sassy, sassy!!! LOVE it. There’s so much poetry, truth, and beauty in your words. I feel you! Picturing you twirling in your blue stilettos makes me smile and laugh with joy. I saw a flock of robins yesterday in the snow and my heart surged. Soon it will be spring! The temperature this weekend is supposed to be 60 with sun, and it is either a wicked tease or a sweet little taste of what is to come. A little something to sustain us through these last, few, bleak weeks. I’m going with the latter. So many cheerful reminders that the warmth is on its way. :). Right around the corner now! Let’s all warble in unison. Ha! Never would have guessed. You learn something new every day.